Special bottles and cages for use on Time Trial bikes were all the rage in the early 1980's. The two largest component makers offered these bottles and cages for a time. As road bike sales declined with the advent of mountain bikes, so did special equipment for such specific road events. Times have changed. 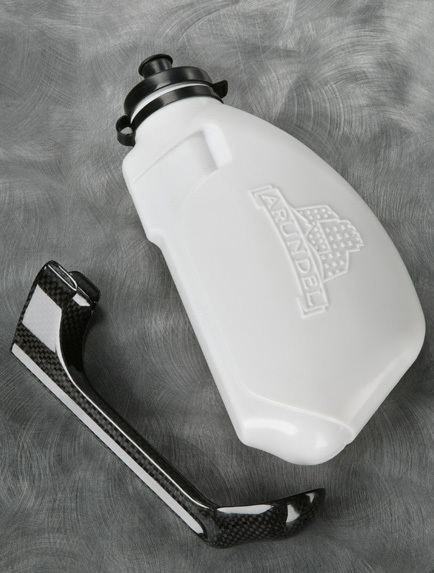 Our Chrono bottle and cage combo is specifically shaped for races against the clock, including triathlon. The odd shape pays special attention to the mechanics of releasing and inserting the bottle in the cage. The cage and bottle mate together in a positive snap. The countersunk surfaces on the bottle form a seamless interface with the cage. The bottle flows in a natural route in and out of the cage enabling the rider to spend less time getting a drink. The cap on the bottle is an industry standard with a mouth wide enough to use ice cubes or sports drink powder. Our logo serves to improve the grip. We are confident our Arundel Chrono strikes a keen balance between a slippery aero shape and the critical issue of useability. The bottle is offered in white with a black cap.